Anne Wivel documents how the renowned painter Per Kirkeby struggles to rise again after an ill-fated fall down the stairs. 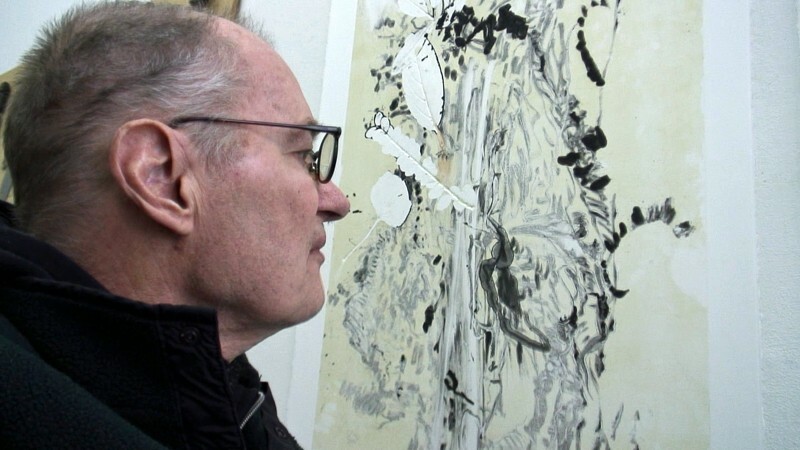 A fall down the stairs in 2013 forced Per Kirkeby, a towering figure in modern Danish painting, to stop painting. Hitting his head, the fall cost him the ability to recognise colours, his own works, at times even his own wife. Shot over roughly a year, Man Falling documents at close range Kirkeby’s struggle back to the easel and his fear that the baby steps he is making are illusory. Anne Wivel holds an important place in Danish documentary film with a long line of award-winning films to her credit both as director and producer, including (as director) Giselle (1991), Søren Kierkegaard (1994) and, most recently, Svend (2011), a portrait of her cancer-stricken husband, the Danish politician Svend Auken, and his last busy days. Man Falling was selected as the opening film for CPH:DOX and takes part in IDFA’s special section Sounds Real. A highly esteemed figure in Danish documentary, Anne Wivel in Man Falling turns her camera on her friend, the world-renowned painter Per Kirkeby, who is struggling to get back to work after he fell down the stairs and hit his head, which cost him the ability to recognise colours, his own works, even his own wife. For four years the Danish filmmaker Anne Wivel hadn’t touched her camera. She put it down after her cancer-stricken husband, the Danish politician Svend Auken, suffered a fall in their summerhouse in July 2009. For two and half years she had been tracking his busy life with her camera. Three weeks after his fall, he died. Auken was already fatally ill, but the fall shortened his life. Ever since, Wivel’s camera had been turned off. 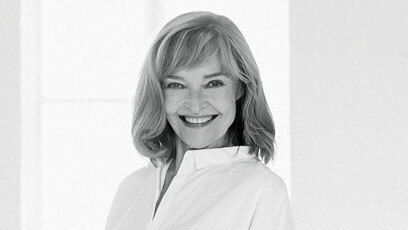 Fast forward to fall 2013 when she got a call from an old friend, the world-renowned Danish painter Per Kirkeby, and his wife. Kirkeby had fallen down the stairs and suffered a brain injury that spring. He had been in the hospital for months, but now he was back home and Wivel was going to visit him the next day. “They asked me if I could bring my camera. I was a little bit scared, frankly. Both because I hadn’t touched my camera since Svend died and because Per is such an authority for me. I’ve known him for more than 40 years, but he can be kind of intimidating. He knows, and we laugh about it. And yet, he is so loved, too, and very sharp and funny,” she says. He no longer recognises his own works. At times, he doesn’t even recognise his own wife, because his brain no longer converts his visual impressions in a way that makes sense. Svend Auken and Per Kirkeby are distinctive public figures in Denmark. But for Anne Wivel, the two films are about her husband, Svend, and her friend, Per. “The film about Svend is a home video, only it isn’t made by an unaware person. I continue that in my film about Per, who has been my friend for more than 40 years. The film about my husband was a love story, an unconditional love letter. Man Falling is a bit like that, too. It’s made unconditionally. I’m completely devoted,” she says. When Kirkeby and his wife called, Wivel had actually been planning to start a film about the palliative care unit at the hospital where she and her husband stayed for the last 10 days of his life. “But then I got the call and thought, Okay, this is fate compelling me to take up my camera. It made sense in a way to pick up where I left off, with a man falling. There was something about Svend that I wanted to think about more. But it wouldn’t be in the setting of a palliative care unit. It would be in the world that I move in, where a man had fallen, like Svend did. In my mind, the two films are connected,” Wivel says. “Both films are about loss, these men suffering these losses. We need to own it when frailty arrives. You could say that I’m empathically looking into a space that I’ll be entering at some point,” she says. Even so, his friends and fellow artists stimulate him to pick up a pencil or mark a canvas with a brush. 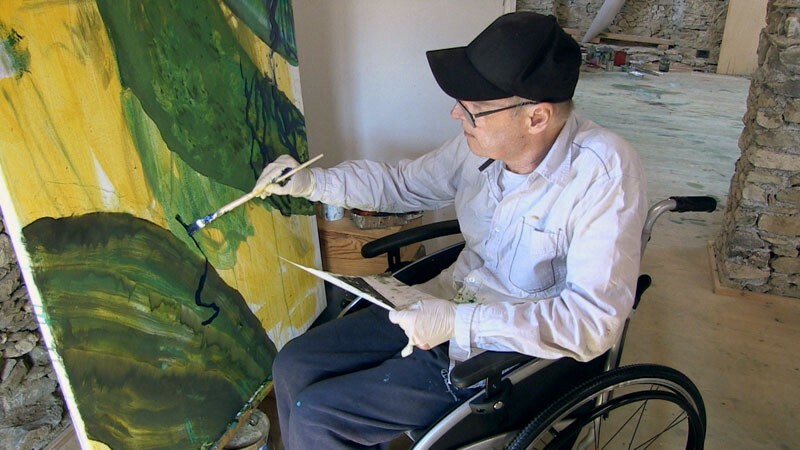 At one point, he rolls his wheelchair over to a huge canvas in green and brown tones and looks at it for a long time. He contemplates the canvas a while longer. Man Falling ended up being what Wivel calls “a very handheld project.” Kirkeby is hard to control, he doesn’t want a mic pinned to his clothes and he “practically suffers from diarrhoea of the mouth,” as Wivel puts it. Some of the film’s sequences are scored with music by Brahms. Others feature an abstract layer of sound as the director’s idea of what it sounds like to be inside Kirkeby’s head. Then, the soundtrack leaves the sounds of the real and recognisable world behind and enters a distorted space where something isn’t right, a space full of creaking, collapsing, wailing, shrieking, squeaking and rumbling. That’s what the film is about: something has broken. We may be able to stay alive for a very long time nowadays, but many of us suffer great losses along the way, Wivel says. Her husband and her friend, in her last two films, have suffered such losses. It has been 20 years since Anne Wivel gave up working with large crews and picked up the camera herself. Her big-crew productions culminated in the early 1990s in Giselle and Søren Kierkegaard, films that are “totally top tuned aesthetically,” as she puts it. The first film Wivel made all on her own was also about Kirkeby, incidentally. The Castle in Italy was shot over Easter 1995 and premiered in 2000. Kirkeby and his then wife had asked her to spend the Easter holiday with them at their palazzo. Back then, they also asked her to bring a camera. At the time, Kirkeby was in a different kind of crisis. That was 20 years ago. They now went back to the castle again. Man Falling is selected for Sounds Real, IDFA’s special section this year celebrating sound in documentary filmmaking, and is produced by Sigrid Jonsson Dyekjær for Danish Documentary Production. Director, producer, born 1945. Educated as a painter and graphic artist from the Royal Danish Academy of Fine Arts in 1977. Graduated in direction from the National Film School of Denmark in 1980. Wivel holds an important place in Danish documentary film with a long line of award-winning films to her credit both as director and producer. Among her most renowned titles as director are Giselle (1991), Søren Kierkegaard (1994), The Castle in Italy (2000), The Land of Human Beings – My Film about Greenland (2006) and Svend (2011). Premiering at CPH:DOX in early November, Man Falling (2015) is selected for IDFA’s special section Sounds Real. Man Falling is selected for Sounds Real, a special section at IDFA this year focusing on the power of sound in documentary filmmaking. The festival has asked five internationally renowned sound designers to each single out two titles – one new film of their own and one film credited to a colleague. Thus Kristian Eidnes Andersen, who has designed the sound for films by such celebrated filmmakers as Lars von Trier and Nicolas Winding Refn, and Thomas Jæger chose as their own film Anne Wivel’s portrait of Per Kirkeby. Their choice of a work by a peer fell on Megacities by Michael Glawogger.